If you’re looking for some dreamy, charming and relatively undeveloped islands to get off the beaten path in Indonesia, consider heading to the Eastern side of the archipelago. Here, the beauty of the Banda Islands, Maluku province, the Kei Islands also in Maluku and Raja Ampat in Papua, will make you wonder why people bother to go to Bali and Lombok at all (granted the more touristy islands have way better facilities than any of those on Eastern side of Indonesia). What are the Banda Islands, Maluku? 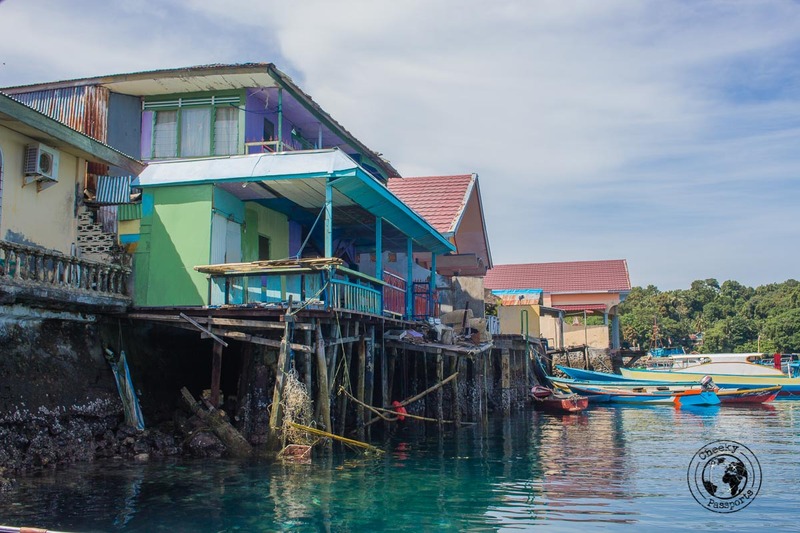 The central part of the Maluku Province is home to a small archipelago with a fascinating history, whose alternate name bears testimony to the island’s turbulent past. 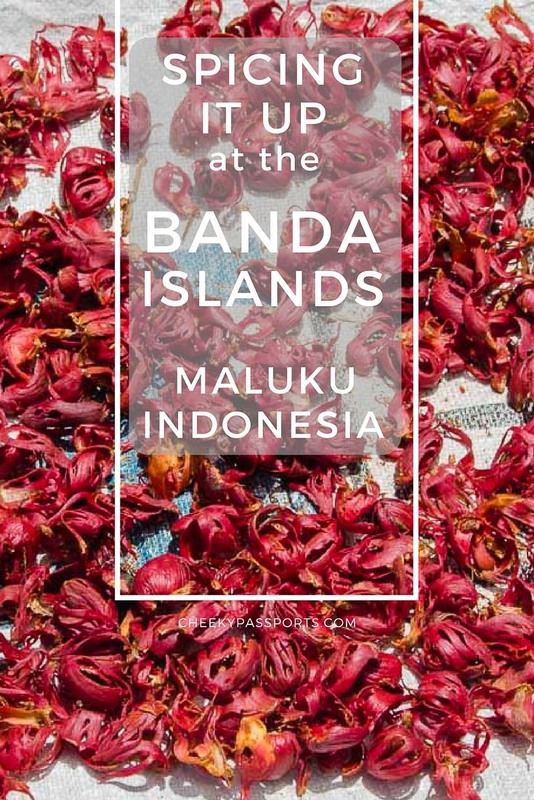 Indeed, the Banda Islands, Maluku are better known as the Spice Islands. 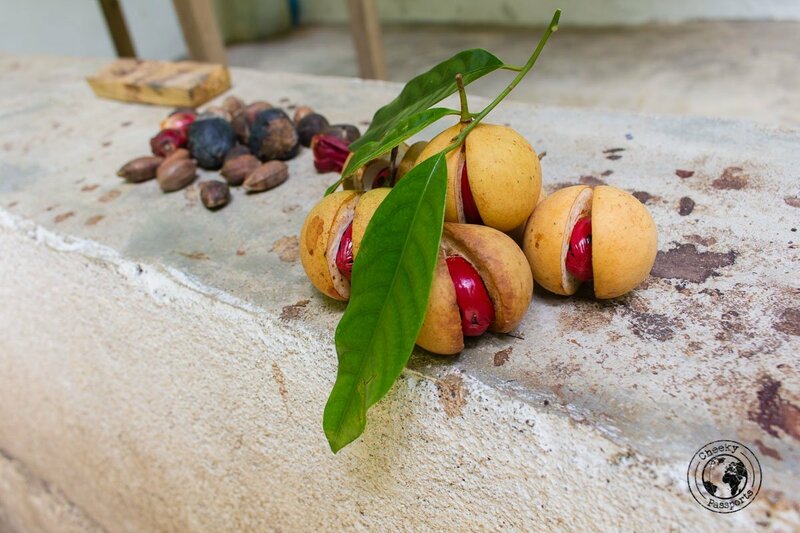 They were once the only source of nutmeg in the entire world, a situation which marked their importance in international trade at a time when nutmeg was valued at par with gold. These tiny and remote islands had a massive impact on European trade, with the result that the land on Banda became some of the most expensive in the world. It is hard to tell this nowadays, as you gently stroll among Bandaneira’s dusty roads in between crumbling colonial houses and little shacks, selling all kind of convenience wares and candied nutmeg. If you’re heading to Banda, we really recommend reading Nathaniel’s Nutmeg: or, the True and Incredible Adventures of the Spice Trader Who Changed the Course of History which gives an account of colonial warfare happening around the Banda islands. You can also follow this historical documentary by BBC, if you have an hour or so to spare! 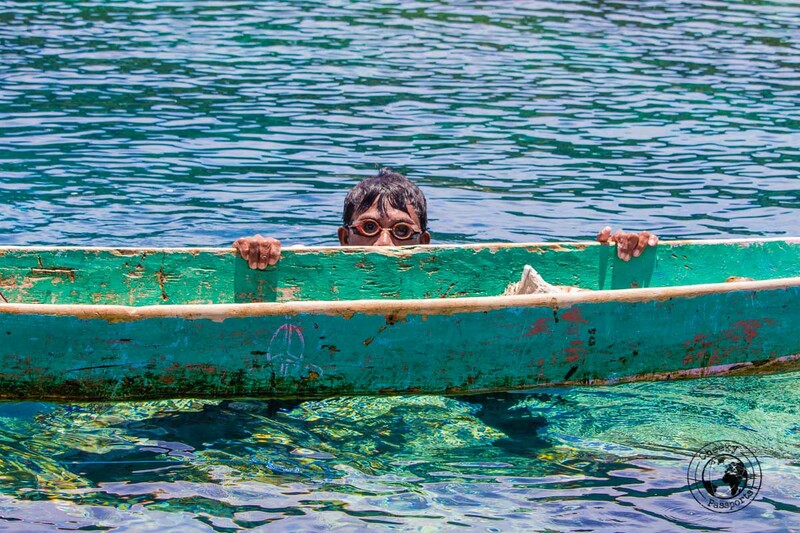 Off the beaten track is an understatement on the Banda Islands, Maluku. Bandaneira, the main island, is home to a ferry terminal and a small airport but that’s hardly evident, given the small number of people that make their way to the islands. Banda islands accommodation are mainly concentrated on Bandaneira. Seven of the volcanic islands are inhabited and are interspersed with some uninhabited islands. Ferries run infrequently between some of the islands but speedboat transfers can be arranged. The active volcano Gunung Api, is found on Banda Api. Banda Besar is the largest island with spice settlements, whilst Pulau Run is the island which was famously exchanged for Manhattan by the British to the Dutch. Pulau Ai and Pulau Hatta are on opposite sides of Bandaneira, and both feature sandy shores which are home to some basic Banda islands accommodation. 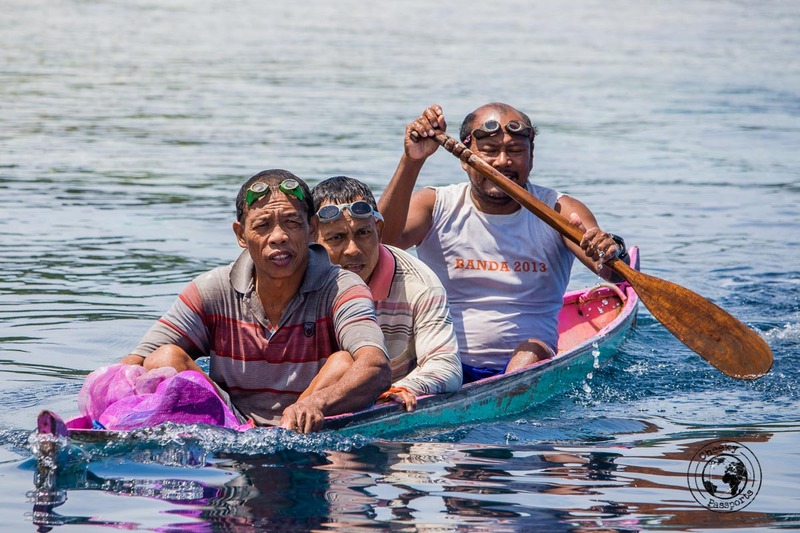 How do you get to the Banda Islands, Maluku? Ferries run from Tulehu near the main town of Ambon (also in central Maluku) twice a week. Flights to Ambon from Makassar, Jakarta and other airports in Indonesia can be booked here. If you’re looking for accommodation in Ambon before or after your journey to Banda, consider staying at Stori hotel. Our room was small but very functional with a shower that was separate from the rest of the bathroom – a luxury in Indonesia! We paid 240,000 IDR (about €14.70) for the room. Kuta Ambon is about an hour’s drive away from the airport and an angkot transfer will set you back 20,000 IDR (about €1.25) per person. Check the latest accommodation prices in Ambon (gateway to Bandaneira) on Booking.com or Agoda. The ferry from Tulehu runs at 9am on Tuesdays and Saturday and returns on Wednesdays and Sundays, but is sometimes cancelled or suspended. Bluemotion’s website seems to have the most updated information about the different transport options to Bandaneira. Tickets, which cost IDR 410,000 (about €25.30) each at the time of writing, can be purchased directly before boarding so aim to be at the harbour at around 8am. Mr. Farouk (+62 813 4329 2900) also seems to know all the details regarding the ferry operations to the Banda Islands and we contacted him via WhatsApp the day before we intended to make the crossing. He assured us that the ferry would be running as scheduled the following day. One company was running flights on a small 12-seater plane during our time on Banda, but very little information about the crossing was available, although the price of a ticket on the plane seemed to have been cheaper than the ferry ticket. The schedule is completely unreliable and departure only guaranteed a few hours before the flight, with much of them occurring according to the demand most of the time. Bandaneira is the main administrative island in the archipelago and the logical place to base yourself, unless you want to stay in the smaller, more remote islands in a guesthouse on the beach. Bandaneira itself is not large and you can easily walk around to find anything you need. Some restaurants and a few convenience shops are available around the main ferry road. Banda islands accommodation is quite limited, but we have absolutely no doubt at all that the best place place to stay at is the estate of Cilu Bintang. Abba, the tireless Indonesian man running the place can provide you with almost anything you need during your stay. The colonial estate, a former property of the Dutch East India Company (VOC) is simply spectacular, containing not only heritage-style rooms but is also home to ancient artefacts contemporary to the spice trade era, such as maps and kitchenware. The place is spotless with a beautiful terrace upstairs containing comfortable armchairs and even a telescope. We cannot recommend this place enough if you have the budget for it. Unfortunately, we did not! So, we stayed in Abba’s other accommodation – Mutiara Guesthouse, another less-grand, but still beautiful colonial house in a small room for 250,000 IDR/night (about €15.45). The larger rooms cost a little bit more. The great thing about staying at this Banda islands accommodation option, is that you get to have the complimentary breakfast at Cilu Bintang located about 2 minutes’ walk away. And by breakfast we mean the best spice pancake you will ever taste in your entire existence, sprinkled with cinnamon, loaded with almonds and served with nutmeg jam. Other egg dishes and toast are also available, but why would you miss out on the spice pancake when you’re on the Spice Islands? And more… Abba organises buffet BBQs dinners at Cilu Bintang, quite frequently, for 100,000 IDR (about €6.20) per person. We went to about four BBQs during our 6-day stay and the dishes served were easily some of the best we had in Indonesia. Not only was the barbequed tuna incredible, but the salads and side dishes are out of this world. 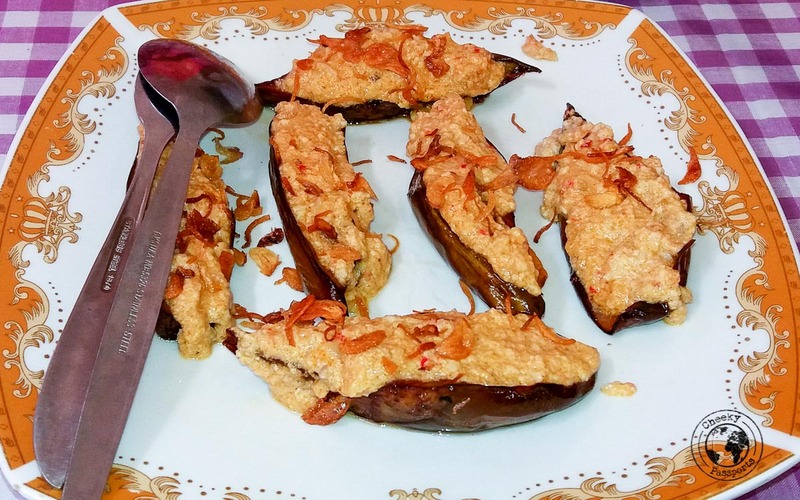 The local dish of roasted eggplant in kenari sauce was our personal favourite and I couldn’t get enough of it. Stir fry dishes of vegetables with quail egg, roasted potatoes, other fresh vegetable dishes, versatile noodle and rice dishes, tuna ball soup and custard tarts for dessert were all perfectly cooked. After months of eating a variation of mie goreng, nasi goreng, soto ayam and bakso three times a day, we genuinely felt we were in foodie paradise and would get excited as dinner time approached! There’s a sprinkling of other guesthouses on Bandaneira, and also a couple on Pulau Hatta and Banda Ai. We spent all of our nights on Bandaneira, which we felt was more convenient, although we did go on day trips to the other islands. For the best deals on Banda islands accommodation check Booking.com. 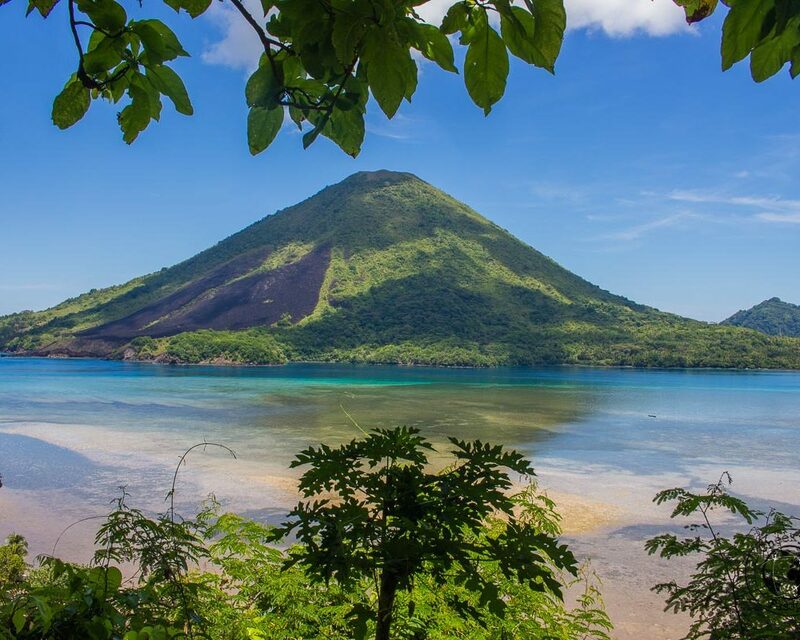 Is it difficult to island-hop around the Banda Islands, Maluku? Not at all if you charter boats, best shared with any other visitors to the islands. Public ferries to and from some of the islands are available, but you might have to spend a couple of nights on one of the other islands if you decide to use ferries since they don’t run to and fro every day. This is in no way a bad idea if you have time as the islands are gorgeous! 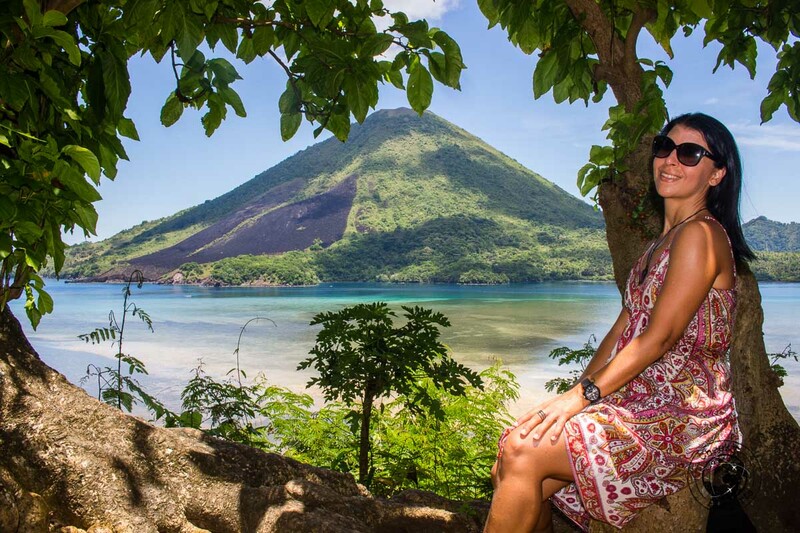 If you want to go on day trips to the other islands from Bandaneira, it is best to ask the management of your Banda islands accommodation whether they know of boat trips you can join. Abba at Cilu Bintang organises day trips for his guests on a daily basis (according to demand) so you could easily join one of these if there’s place. We went on one island hopping trip which included Banda Run, Banda Ai and some of the smaller uninhabited islands, another trip to Pulau Hatta and a third trip to Banda Besar. 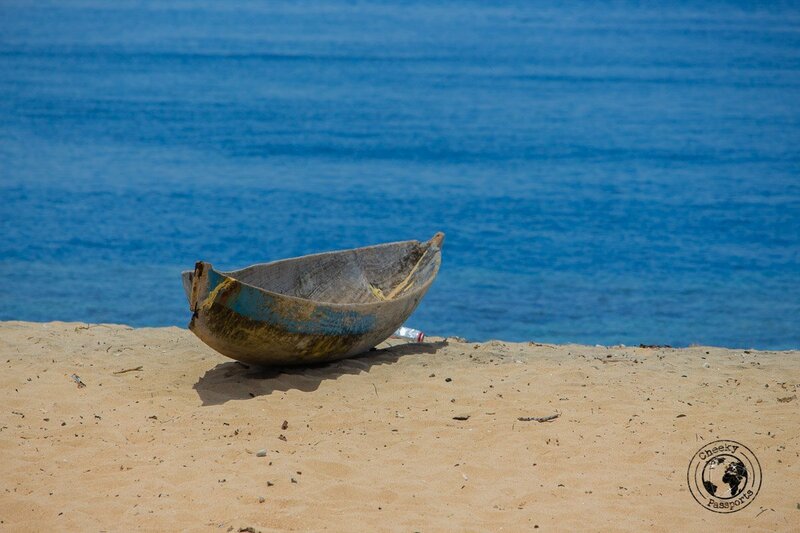 Although not cheap, they were made affordable by the fact that we always shared the boat with other guests. Refer to separate section above “Is it difficult to Island Hop around the Banda Islands, Maluku?”. We went on three separate boat tours organised by Abba of Cilu Bintang. The first tour was a trip to Pulau Run, Pulau Ai and the uninhabited island of Nailaka. 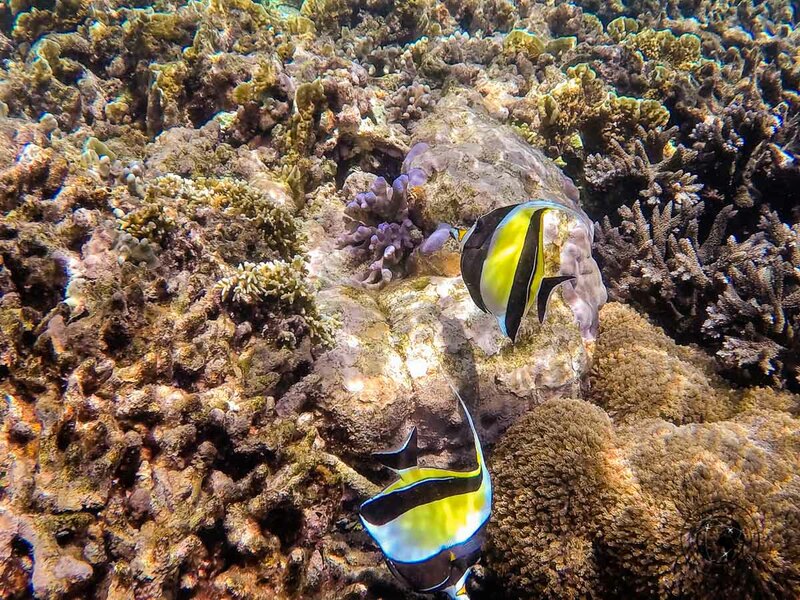 The snorkelling around Pulau Run was stunning with lots of coral, turtles, sharks, parrot fish and napoleon fish. 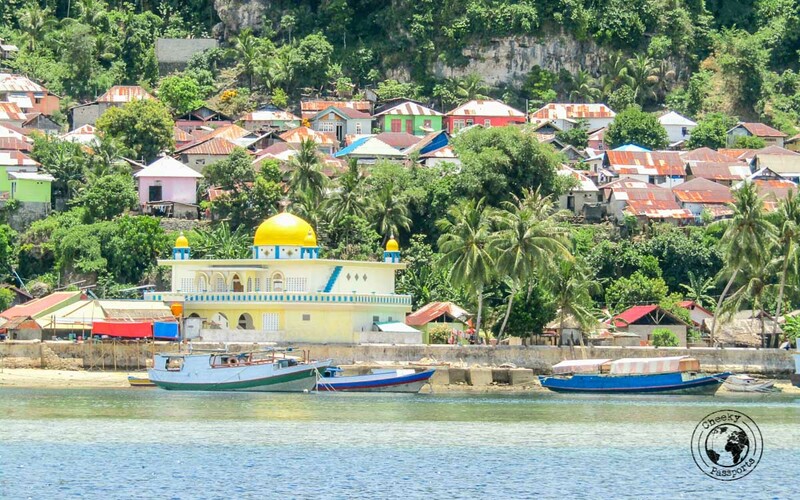 Pulau Run itself, which is only 3 km long, is home to a small Muslim fishing community with two mosques which can be heard concurrently making for an interesting medley. If you intend to swim on the beaches or coast around the island, it is best to swim in unrevealing swimwear (such as a t-shirt) since the community is very conservative and we heard of tourists being told off for wearing too little. It is fine to strip down to a bikini or swimming trunks if you’re further away from the inhabited area. Pulau Ai is home to a pretty beach, seemingly home to some fishermen, and a small guesthouse (an alternative Banda islands accommodation) where we were offered cinnamon tea and banana fritters as we relaxed on the terrace, whilst taking in the spectacular views of the surroundings. Nailaka is tiny but again there’s some good snorkelling around it and a white-sand beach to relax on if the currents get too strong (they do)! The trip cost 300,000 IDR (€18.50) each inclusive of lunch. Masks and snorkels can be rented for an extra fee. This day trip to Hatta Island was all about snorkelling, which is simply amazing around the reef in Hatta. The clarity was not perfect so we found that annoying, but the great number of coral and fish easily made up for it! We spent most of the day snorkelling in different areas around the island, swimming with turtles and reef sharks and relaxing on the beautiful sandy beach. Divers have been known to spot hammerhead sharks in this area, but unfortunately we didn’t spot any. Just a perfect day in paradise! The cost of the trip was IDR 250,000 (about €15.30) each with lunch included. We were worried that the Spice Tour to Banda Besar might be a little too commercialised for our taste, but we enjoyed our visits to the spice plantations and the great vistas from Banda Besar, although I suspect that it could easily have been organised independently if only we had thought about doing it before. The cost of the trip was IDR 250,000 (about €15.30) each. With the possibility of spotting Hammerhead sharks, Banda islands diving was at the top of Nikki’s bucket list, but unfortunately he was a little unwell during our time there and decided to avoid risking going underwater. Read his tips about Diving with Diabetes. The best time for Banda islands diving is in March and April and from mid-September to December. Indeed, we were on Banda towards the end of October during peak season and diving spots were scarce too! There are several dive sites around the island. Be sure to liaise with your operator if there’s a specific one you want to go to when Banda islands diving. One of the largest diving outfits on Bandaneira is Dive Blue Motion. During our time there, most of the dives were fully booked from days before, although they had ‘standby’ options. If you are considering diving with this company be sure to book your dives beforehand! Preference is given to divers staying at their own resort. Friends we made during our stay on the islands were very happy with the services of this company although we didn’t use them ourselves. Other dive outfitters for Banda islands diving operate from Bandaneira and other islands. The snorkelling around the Banda islands is also pretty good, so we enjoyed visiting different sites on our boat tours to experience the diverse underwater scenery. You can snorkel just off Bandaneira itself. Some of the other guests at our accommodation told us that they were scared off by sharks one time when snorkelling on one end of the coast! 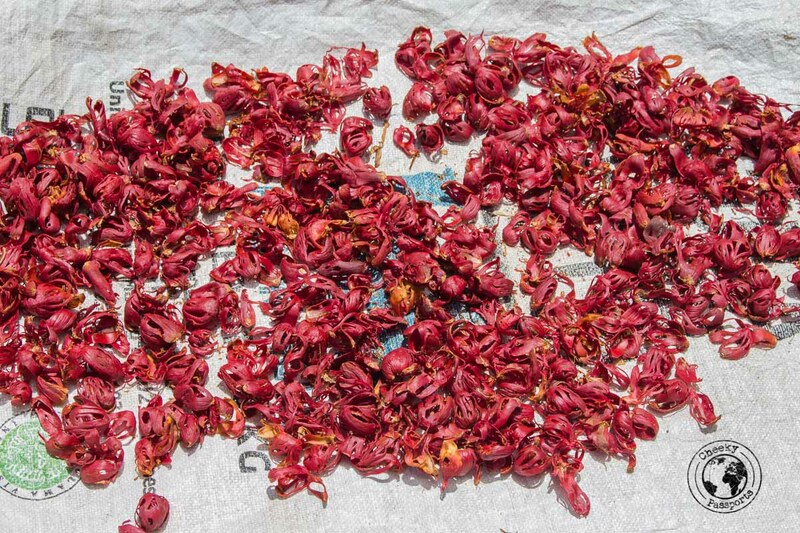 A spice tour normally takes place on Banda Besar which is where the majority of the spice plantations are. Our local guide took us for a walk around the island, pointing out at almond trees, cinnamon bark, and nutmeg trees along the way. 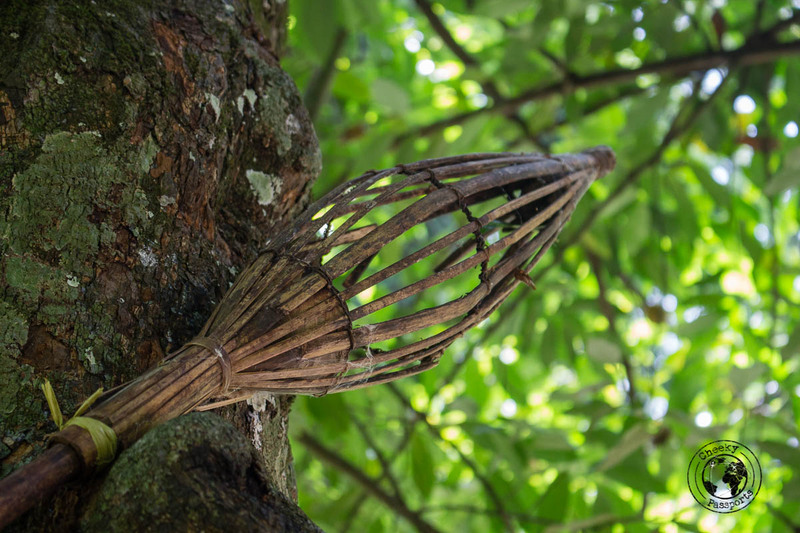 We also got the opportunity to speak to some farmers who explained the history of nutmeg and mace and showed us how, and why, the plantations flourished on the island. The cinnamon tea served at one of the worker’s houses was a fitting end to a very pleasant walk and information session about why Banda was so important in the past, although it did feel a little like being on a school outing! Apart from the fantastic dinners at Cilu Bintang in the evenings, we enjoyed quiet sunset walks along the coast of Bandaneira where we could observe fishermen bringing in their daily catch in the warm shadows, created by the sun setting behind Gunung Api. We relaxed so much during our evenings on Bandaneira, that we actually discussed the possibility of eventually using it as a digital nomad base, although internet speeds leave much to be desired! We had to miss out on doing this since we were unwell on the day we wanted to attempt the climb, but other guests told us that the views from the top of the volcano were superb, although the path up is full of gravel and loose stones making it very slippery. It makes a lot of sense to start the climb early since the trip will probably take 5-6 hours, and you really don’t want to be climbing up in the midday sun. Also, wear good trekking shoes and take plenty of water! If you want to learn all about making Bandanese delicacies and other Indonesian dishes, you’re in luck! 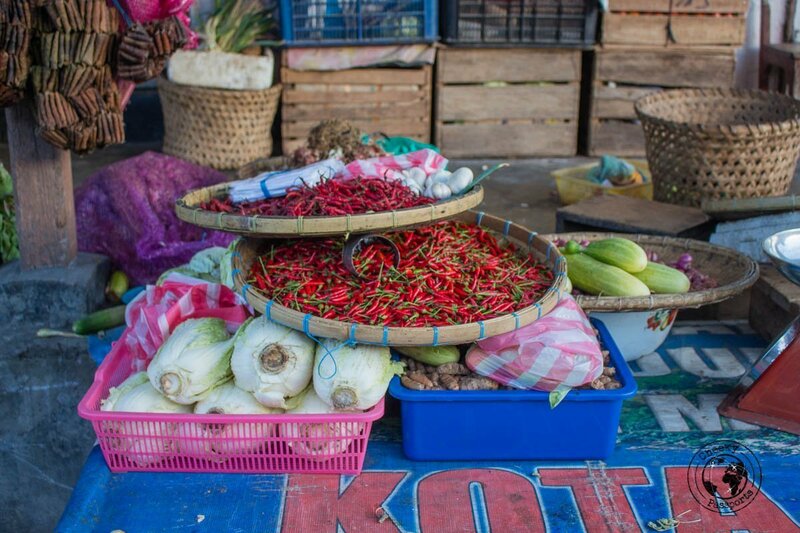 Abba’s wife at Cilu Bintang, in our opinion the best Banda islands accommodation, holds regular cooking classes set to teach you all you that you need to know about the local produce and how to use the islands’ spices effectively. Where should I eat on Bandaneira? Without a doubt, the buffet BBQ at Cilu Bintang (sorry for stressing this out so much, but it was truly worthwhile)! You will need to go ask in the morning whether its happening though since Abba doesn’t organise it every day. There are some other restaurants which serve different stir-fried dishes, eggs and pancakes but they simply do not match up. 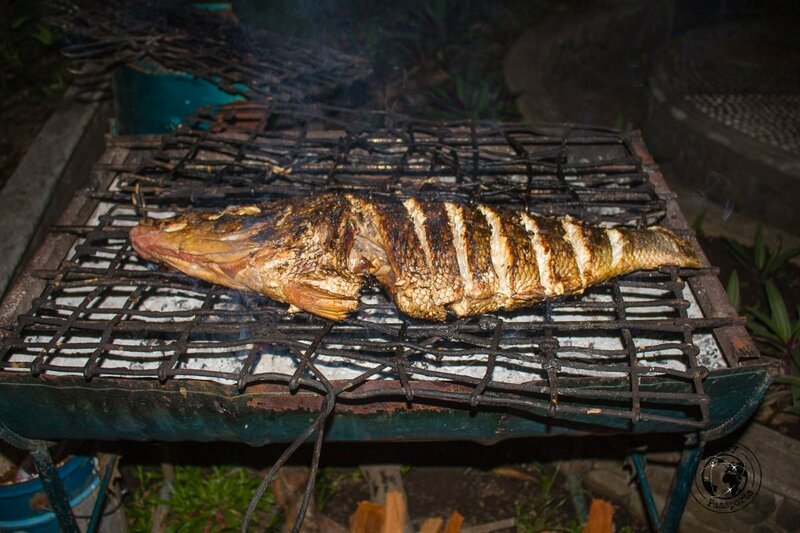 What can I eat on the Banda Islands, Maluku? The food of the Banda Islands is particular for its inclusion of ‘sweet’ spices and almonds which the islands are loaded with. Nutmeg, cloves and cinnamon are used liberally in many dishes. Nutmeg soup is typical of the islands and nutmeg-, clove- and cinnamon-laced coffees are widely available. Roasted eggplant in kenari sauce was easily our favourite dish and reminded us vaguely of the Badridzhani Nigvsit we had fallen in love with in Georgia (eggplant in walnut sauce). Nutmeg jam can be found in all restaurants and is a typical breakfast condiment for pancakes or bread, whilst candied nutmeg and almond brittle are widely sold at all roadside shacks. In conclusion, should I go to Banda Islands, Maluku? Yes, and yes and again yes. We cannot stress this enough if you are looking for a destination in Indonesia which is as removed from resorts and the tourist vibes of Bali and other more popular islands as can be. The peace, quiet and charm of the Banda islands, Maluku make them the perfect place to relax and unwind in a destination where time stands still and which the rest of the world has yet to discover. Be sure to carry a flashlight on the Banda islands, since power cuts are frequent. It would be wise to take a Powerbank in case to keep your electronics charged in case of a powercut. 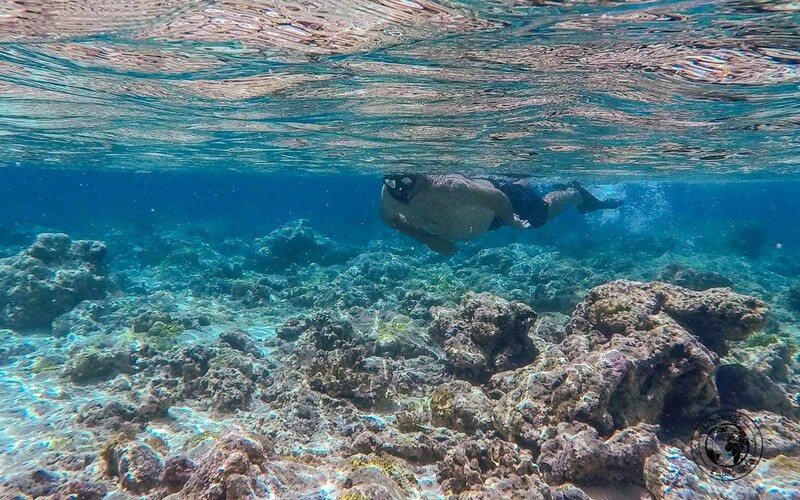 Taking your own snorkelling mask will save you some bucks – they are rather expensive to rent! Be sure to always carry a light rain jacket since short rain outbursts are common on Indonesian Islands even outside of the rainy season. 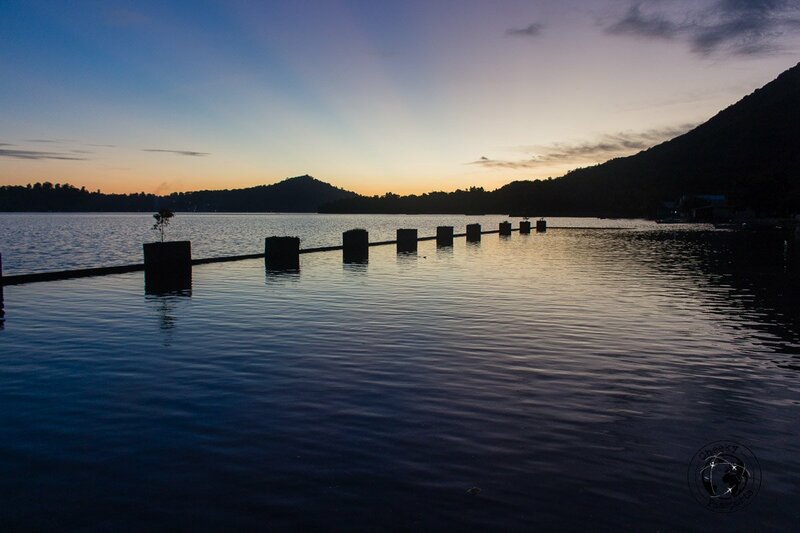 Try booking your Banda islands diving beforehand, since it is a very popular activity around these parts! Wow, I love how wild it seems there! 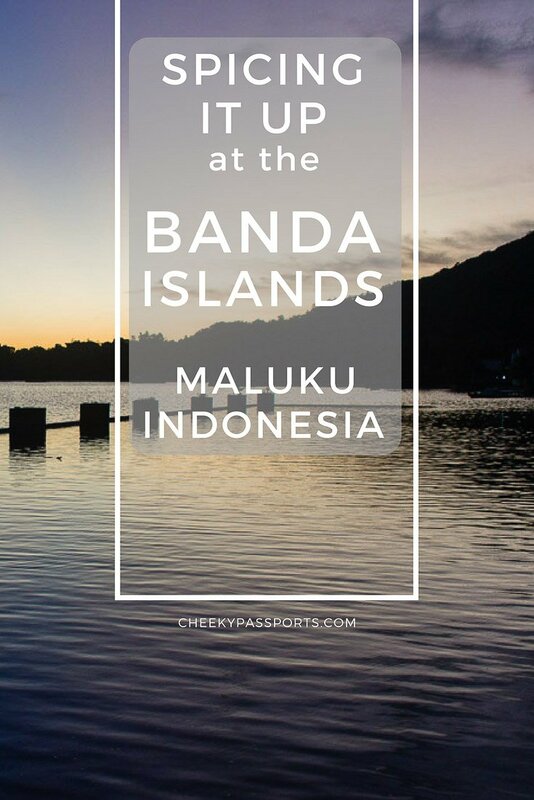 Thanks for sharing – I didn’t even know the Banda Islands existed before reading your post! Photos are beautiful and inviting. Thanks for all the detailed information on tours and cost, I will definitely include it when we plan on Indonesia. What is the best time to go there? I’d love to visit the Banda Islands – and taking a cookery class seems like an excellent idea as does the buffet BBQ at Cilu Bintang. The spice tour sounds fascinating too. As a sun-starved brit, I’d also need to spend some time on the beach. Obviously I should be there for a week or more! Roasted eggplant sounds exotic. I have been to Raja Ampat but Banda islands seem very similar. The marine life is simply beautiful. The first looks interesting – wonder who chose to build one in the middle of nowhere. They are not too far from Raja Ampat in fact! The underwater life here is indeed amazing! 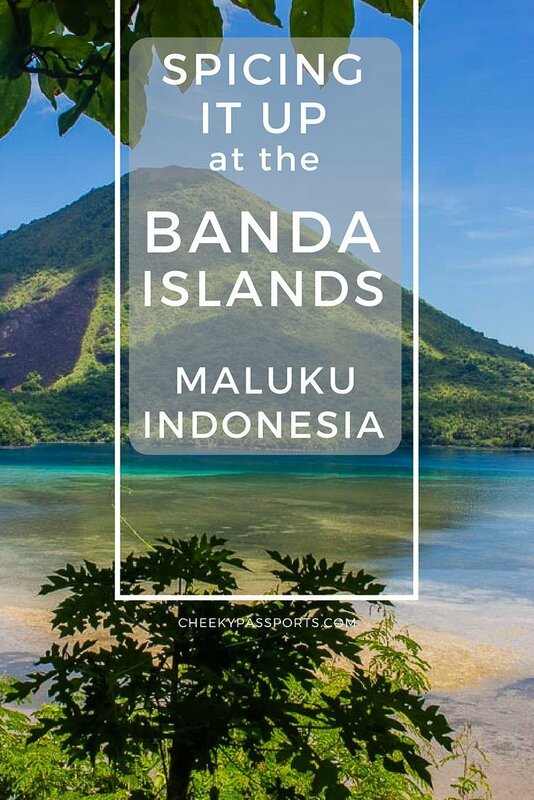 I confess I have never heard of Banda Islands or even Maluku for that matter but when I read they’re in Indonesia, I was pleasantly surprised because I was in Bali recently and I never knew about these gorgeous off-beat places. Its true that sometimes going to touristy places gets a bit much, there are just too many people there and we often don’t realise that there are so many other equally beautiful places in the country that are not known and maybe, make for a better trip. Thanks for sharing this information, I am happy to learn about an off-beat destination in Indonesia. Thank you Medha! We tend to travel to the more off the beaten track places so the Bandas were very much our thing! We did enjoy stuffing our faces with good western food in Bali and enjoying the amenities though! We missed those in Banda! I never heard of the Banda Islands before but there seems to plenty to do. I love the looks of the beach there and could easily stay some time here relaxing. Fantastic read and loving your photos. Thank you! Yeah the beaches are quite spectacular in eastern Indonesia! one of the best things about the islands! Hi! I like your post very much. I am planning on going in September with my boyfriend for around 25 days. How long were you there? Is it possible to take a boat to some of other islands and spent there a few days? Because I think I read somewhere that you can take a boat to other islands and it costs like 2-3€, but I am not sure if that post was about Banda Islands or somewhere else in Indonesia :D.
25 days on the Banda islands sounds like alot although there’s plenty to see and do! You can certainly take the local ferries in between some of the islands if you are willing to spend a few days there! We didn’t have the time for that unfortunately! Thanks for the info! We want to take it easy, so I think 25 or a little bit less will be perfect for us. Wow, what fabulously bright photos. Love them! I was transported there while reading your blog. 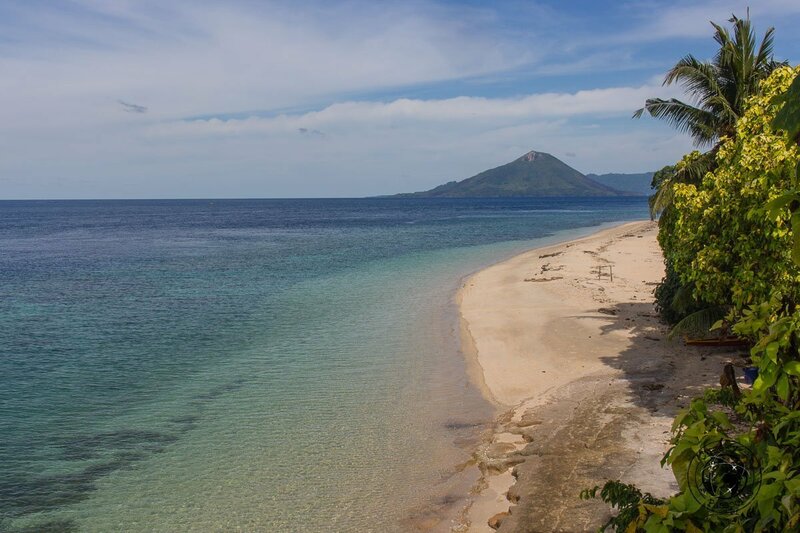 It shows how unspoilt the Banda Islands are, in that I had never heard of them. I was always weary of visiting the over-touristy areas, as I don’t really like resorts or lots of people… but the Banda Islands sound like the perfect alternative. I would definitely try to stay at at Cilu Bintang if I could afford the colonial estate! I’d definitely try snorkelling, but perhaps not near Bandaneira if there are hammerheads around! I have never heard of these islands, but they look like paradise.It looks like the perfect place to unwind and forget about the world for a while. I like the idea of the spice plantations tour as well. I always like learning a bit about local culture as well so the cooking class sounds like a great way to get a better understanding of island life. Every time I hear about Indonesia it is about Bali. 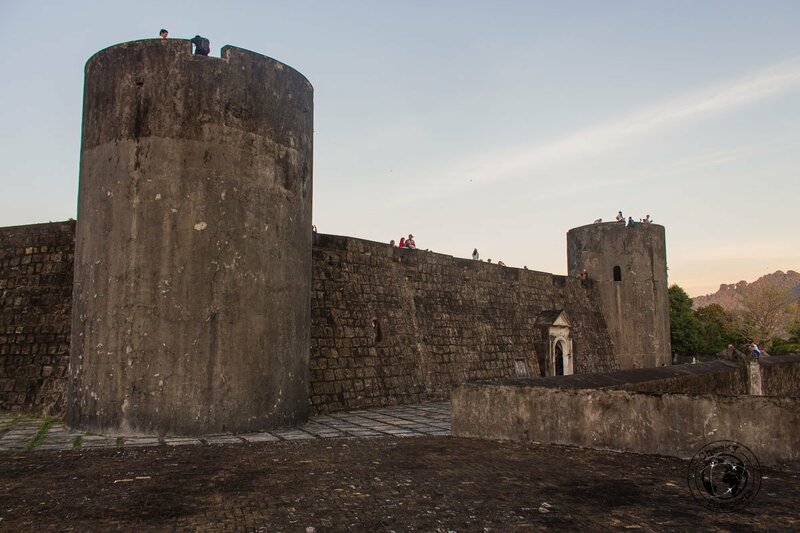 It is so refreshing to hear about another part of this beautiful country. I have yet to visit Indonesia but rather than going to Bali, I’d rather explore Banda Island. There is a lot do and it is so relaxing. I love the tour Pulau Hatta and the price is phenomenal. Thanks for sharing your trip with us. This is such a wonderful off beat destination of Indonesia. I did snorkeling along Nusa Penida and the marine life was amazing. Your picture reminded me of that. Didn’t know they charge heavily for the equipment. Thanks for the tip on power cut there. Best to go fully prepared for all eventualities. That sounds like a great place! I’d really like to try that spiced pancake! I love having my socks blown off by delicious food. I’d be up for all three of those tours, as well as the cooking class, and, well, actually all the activities look great. I hope to be in Indonesia by the end of the year, and I’ll have to check this place out! Thanks so much for this – we are in Australia and starting to plan out an Indonesian getaway, though I hadn’t heard of the Banda and Kei Islands, or the Maluku province yet. So many islands in Indonesia to choose from so it’s tough! As history buffs though it sounds like there’s a lot of significance here. Thanks for the recommendations on Nathaniel’s Nutmeg and the True and Incredible Adventures of the Spice Trader Who Changed the Course of History – will check these out. It sounds like there’s a lot to do beyond history though, and glad to hear it’s easy to organize island hopping. Off the beaten track is our travel style exactly, so I’ll look into including it in our itinerary. Thanks for the tip! If you like history, then you should definitely read about the Bandas and how tiny Pulau Run was exchanged for Manhatten! Extremely fascinating! Enjoy planning Indonesia and get in touch if you need any tips, we traveled around there for 4 months!